The Voyager series is a group of high-speed diesel-electric multiple-unit trains built in Belgium by Bombardier Transportation for service on the UK railway network. They are used on various intercity services throughout Great Britain, including the UK's longest direct rail service, which is a CrossCountry service from Aberdeen to Penzance which takes 13 hours and 23 minutes to complete. All Voyager DEMUs have a maximum speed of 125 mph (200 km/h). The Class 220 Voyager was built to operate Cross Country intercity services. 34 four-car sets were built between 2000 and 2001 and operated by Virgin CrossCountry. With Virgin's loss of the Cross Country franchise, these were all transferred to the new operator CrossCountry in November 2007. The Class 221 Super Voyager was built as a tilting version of the Class 220. Although visually similar, the majority of these trains have five cars instead of four, and have been fitted with a tilting mechanism similar to that on the Class 390 EMU, although the Class 221 uses a hydraulic system, while the Class 390 uses an electromechanical system. 44 sets were constructed for use by Virgin Trains; of these, 23 have been transferred to CrossCountry with the remaining 21 being retained by Virgin, for use on parts of their West Coast franchise. None of the CrossCountry class 221s now requires tilt since the services were withdrawn from the West Coast Main Line, and their tilting equipment has therefore been disabled to improve reliability and lower cost of maintenance. The Cross Country Route also has not been cleared for the use of Tilting Trains. The Class 222 Meridian DEMUs are broadly similar to the original Voyager units, but feature a number of reliability improvements and different internal layout. Midland Mainline originally ordered 23 sets, which it named as Meridians, to enter service in 2004, replacing Turbostar trains which it had previously used. On entry into service, Midland Mainline received a mix of four- and nine-car units, later re-formed into a combination of four-, five- and eight-car units. 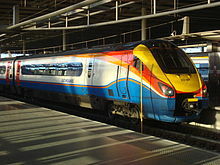 All Midland Mainline's units were transferred to the new franchise holder East Midlands Trains (EMT) in November 2007. When EMT took over the franchise, it removed a car from six of its eight-car sets, to lengthen previously four-car units. The last remaining eight-car unit was reduced to five cars. As of 2009[update], seventeen sets were five-car formations used for stopping services to and from London. First Hull Trains obtained four 4-car Class 222 units in 2005 and named them Pioneers. These were to replace the Turbostars that had provided Hull Trains' initial services. These units are slightly different internally from the Meridian trains. Following a maintenance incident and the long-term unavailability of one unit, First Hull Trains replaced its Class 222 fleet with a fleet of Class 180 Adelantes in 2009. The Class 222 units have been transferred to EMT for use with the rest of the Class 222 fleet. These Pioneers are now known as Meridians. The class 220s and 221s have been criticised for being cramped as they are designed to be able to be converted to tilting operation, since when tilted they must still fit within the loading gauge. Because there is one diesel engine per car, there is increased underfloor noise, vibration and rattles when compared to the InterCity 125 sets and locomotive hauled trains that the units in this family replaced. There is very little space to store heavy luggage or bicycles. Although CrossCountry has now removed the shops from its trains to increase capacity, the bicycle compartment can now only store 3 instead of the original 4 bicycles. CrossCountry services formed of classes 220 and 221 frequently have to be stopped at Exeter St Davids or Newton Abbot when waves break over the sea wall in Dawlish, due to the roof mounted brake resistors. The trains are notably shorter than the trains they replaced, resulting in reduced capacity. In addition, most seating in Standard Class is in airline configuration with fold-down tables, which are too small for large laptops. In 2006, a Class 222 unit had to be taken out of service due to a door opening in Northamptonshire on a London-Sheffield service, while the train was at speed. On 14 March 2008, a fire broke out on a Voyager at Banbury. About 100 passengers were evacuated from the train. On 20 April 2012, a Voyager unit caught fire at Nottingham. The fire was caused by a buildup of grime which was heated by the movement of the train's wheels. On 18 July 2018, a Voyager unit caught fire shortly after leaving Derby whilst operating a service to Glasgow Central. All 175 passengers were evacuated. In 2010 Bombardier proposed the conversion of several Voyager multiple units into hybrid electric and diesel vehicles capable of taking power from an overhead pantograph (electro-diesels EDMUs). The proposal was named Project Thor. In October 2010 it was speculated that 123 additional pantograph vehicles would be manufactured at Derby Litchurch Lane Works, and 21 trainsets converted, at a cost of approximately £300million, however in 2011 the plant did not have the facilities to manufacture steel carriages, though it was expected that much of the work would take place in the UK, and provide work for the Derby plant. In December 2011 a proposal to electrify 30-35 trainsets for the CrossCountry franchise, referred to as "eVoyager", was under consideration by the Department for Transport. ^ Wilkinson, Matt (14 March 2008). "Train fire is out". Oxford Mail. Newsquest. Retrieved 18 July 2018. ^ "Nottingham railway station disrupted after engine fire". BBC News Online. 20 April 2012. Retrieved 18 July 2018. ^ "Train evacuated near Derby after fire beneath carriage". BBC News Online. Retrieved 18 July 2018. ^ "Transport and the economy: Memorandum from Bombardier Transportation UK Limited (TE 89)". Parliament of the United Kingdom. 10 November 2010. Retrieved 4 March 2011. Project Thor, being developed with a number of UK private sector partners, would see 500 existing diesel multiple unit vehicles converted to bi-mode diesel / electric capability, allowing them to operate as electric trains where there is already electrification infrastructure in place, continuing their journey in diesel mode where the wires end. ^ "Bombardier's electrification plan presented to ministers". RailNews. Stevenage. 6 October 2010. Retrieved 12 December 2010. This page was last edited on 19 April 2019, at 20:33 (UTC).